Apple Watch has ruled over the burgeoning smartwatch scene. That is until an attractive Android Wear watch arrived in the form of the Moto 360. Unlike other smartwatches that looked complicated like they have been taken from the future and brought to the past, this smartwatch is more reminiscent of the traditional watch that we grew up with. Therefore, it is easier to get used to since it looks like a familiar device, but it’s packed with more features. The Moto 360 was created to showcase all the good stuff that Android Wear has to offer, which also means going into a tight competition with the Apple Watch. Still, even if it has a lot of amazing qualities, it isn’t perfect yet. For instance, like older smartwatches, its battery life was still terrible. Additionally, it was quite pricey for an Android Wear watch. It is likely that a future iteration of this smartwatch will address its shortcomings. It is also expected that it will come with a sleeker user interface to boot and have more native apps bundled with the hardware. Hopefully, its price will become more reasonable as more smartwatches arrive in the market. When the Moto 360 arrived, the most noteworthy feature about its design was that it came with a round face. During its launch, other Android Wear watches didn’t sport a round face so it was a big deal that Motorola decided to go in that direction. The risk it took worked because the smartwatch it produced looked like a “real” watch and not some futuristic tech that people felt was unnecessary. The round design brought a familiar vibe and this allowed the Moto 360 to stand out in the ocean of Android Wear smartwatches. The shape of the watch isn’t the only thing that Motorola really thought about. It seemed that the brand took its time to construct the smartwatch properly. The materials used and the actual build are both excellent. The housing of the smartwatch was built using stainless steel and glass, which had a similar vibe as expensive wristwatches. It comes complete with a leather strap that was specifically sourced from a premium tannery in Chicago. With a lot of thought placed in constructing this smartwatch, the end-product is a watch that is comfortable to wear and pleasing to look at. Its strap has a more snug fit compared to the smartwatches with rubber straps from Samsung and LG. The leather strap is also lighter compared to the rubber straps used in other smartwatches. Overall, the Moto 360 looks and feels like a regular watch but with advanced tech built into it. 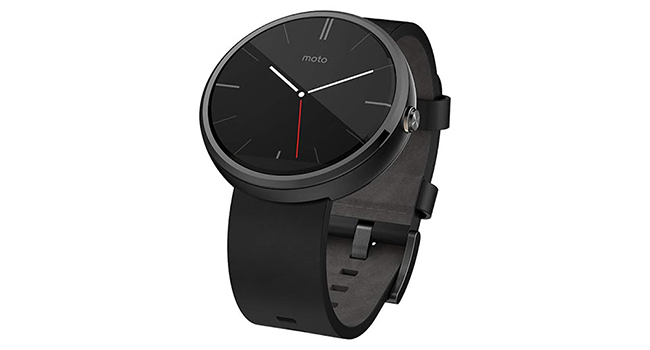 In terms of size, the Moto 360 is 46mm in diameter and 11.5mm thick, which may seem bulky for some users. There is a smaller version that comes at 42mm in diameter but it might still be bigger than a regular watch. However, there is a fashion trend for big watches so its massive size might not really be a dealbreaker. Even if it is big, it is lightweight and comfortable to wear. Its display has a resolution of 360 x 330 at 233 ppi for the 46mm version and 360 x 325 at 263 ppi for the 42mm version. The display is bright and vivid with minimal pixelation when switching from one app to another. The display and the thin bezel surrounding the watch are protected by the durable and scratch-proof Gorilla Glass 3. The downside of having this kind of protection was that the watch has an annoying flat tire bezel at the bottom of the display. Inside the smartwatch, it is powered by a speedy 1.2GHz Qualcomm Snapdragon 400 processor with Adreno 305 450MHz GPU. It came with 512GB of RAM and 4GB of built-in memory. The Moto 360 has an IP67 rating, which means that it can survive getting immersed in up to one meter of water for 30 minutes or less. Just to be safe, it isn’t recommended to do this but at least there is nothing to worry about when it gets splashed with water. Running on Android Wear, the interface of the Moto 360 shows notifications and cards that pop up vertically from the lower part of the display. You can browse the cards and you can remove them from the display by swiping from left to right. Android Wear came with an update especially with gesture features that you can now use on your smartwatch. Without moving a finger, you can navigate the menu on the watch by raising or dropping your wrist. The round face on the Moto 360 came with a tradeoff in that it had a tougher time working with the Android OS. Android Wear wasn’t really designed for circular watch faces so Motorola had to work hand-in-hand with Google to tweak the operating system for its smartwatch. It works okay but it isn’t flawless. For instance, when reading a text on the watch, the text can get cut off on the rounded edges. This also happens when scrolling through a list. The smartwatch has a built-in Wi-Fi capability. Although the Moto 360 can’t accept calls like the Apple Watch, it can direct calls on your phone and receive them from there. Testing out the watch, there were a few times when a loaded watch face crashed. However, it wasn’t a pre-loaded watch face but one we got from Google Play so that might just be a buggy watch face. After crashing, the device seemed to reboot itself and it worked perfectly fine after. We tried other watch faces but didn’t encounter other crashes after that one. When it comes to its fitness tracking features, Android Wear has Google Fit but Motorola also has its own app called Moto Body. Through Moto Body, we got some fitness information including motion, step, and heart rate tracking. This app is quite nifty because it gives notifications of progress at the end of the day, which provided us with a better idea of how well we did compared to the goals that we set. Unfortunately, Moto Body is still for Android only so if you pair your smartwatch to an Apple device, you won’t be able to use it. The app also creates charts of the information that it has collected to better understand the data. These include daily and weekly activity tracking with step and heart rate information. It is quite difficult to find an Android Wear device with a heart rate monitor so this provided more value to the Moto 360. The Moto 360 has a 320mAh battery that gives it about a day of life on a single full charge. This means that you have to recharge the smartwatch every night so you have enough power the following day. In several trials, the smartwatch died in different spans of time. With almost the same usage and with all notifications turned on, the smartwatch lasted a full day on a single charge during one test and it lasted more than a day on another test. With fewer features turned on and minimal use of the smartwatch, its battery life can go up to two days on a single charge. The priority mode came in handy such that it allowed us to get only the important notifications and ignore unimportant ones like spam emails. This also contributed to the lengthening of its battery life. Charging the Moto 360 to full took 35 minutes on the Qi charger. If fully drained, it might take about 45 minutes to fully charge it. A special feature of the Moto 360 is its capability to work as a remote control for an Android phone. By downloading the Remote Shot app, you can access the camera of an Android phone remotely using the smartwatch. You can take photos, change the camera settings, switch cameras from front-facing to rear and vice-versa, and set the timer. When taking photos using the Remote Shot app, you will see whatever the camera sees via the smartwatch. This is a nifty feature because it helps you take photos of yourself even when there is no one else to help you and when setting the timer on the phone just won’t cut it. Even if it isn’t perfect, the Moto 360 is one of the best smartwatches around. It offers a familiar look, a comfortable fit, and a high-end build that is uncommon for an Android Wear watch. Its fitness tracking capability with Moto Body that includes a heart rate monitor makes it a bang for the buck smartwatch. If you are planning on getting a smartwatch, the Moto 360 is one of the best options on the market. Although there might be newer smartwatches coming along in the future that will render this one obsolete, it is still one of the best ways to get into the Android Wear scene right now.